Talk about beating the odds. With both Rondo and Allen sidelined with injuries, an undermanned Celtics team left it all out on the court to win BIG against an 11-4 Orlando Magic squad last night at the Garden. 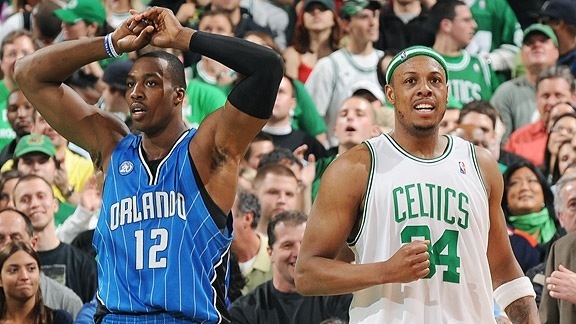 The Celts held the Magic to just 56 points, while putting up 87 themselves. Struggling out of the gates this year, the Celtics have sneakily been solid defensively, ranking third in the league while holding their opponents to an average of 88.3 points. On the other hand, our woes come in the form of offense, where the C’s are ranked 26th in points scored, averaging around 89 per game. I’ve said it before and I’ll say it again. You’re not going to compete with the best teams in the NBA when you can’t score. Luckily the C’s proved me wrong last night, as their defense shone through. Sticking out were Avery Bradley and Sasha Pavlovic, as both stepped into starting spots and held their own defensively while also putting up a combined 15 points. If anything, last night’s win was a big mental boost for the team which has definitely been suffering harsh criticism over the past few weeks and rightfully so. The team has gone in spurts of brilliance but never quite long enough to hold out for the big wins. Example, coming within a point of Chicago in the 4th quarter just to watch Rose and crew rip our hearts out down the stretch. Anyways, there is talent on this team, no doubt. We showed last night that we can compete with the best of them. Throw Allen and Rondo back into the mix and continue blending in the newcomers with the team’s historic chemistry, we’ll be alright. This entry was posted in Celtics and tagged allen, avery bradley, big three, boston, celtics, dwight howard, Magic, orlando, rondo, sasha by jtulz07. Bookmark the permalink.